Commercial or Residential, we have been a successful bidder and builder with many projects in the Eastern Ontario and Ottawa regions. We deliver efficient projects with full transparency and high quality workmanship. If you have a design and are looking for a general contractor to build your project for you, we are here to help you and provide you with competitive pricing, organized approach, and meeting your budgets and timelines. Let us build the design you have, and we promise you a smooth process from start to finish. As General Contractors, KCM strives to deliver projects of high quality at the most efficient, and competitive rates. A construction project can be simple or complex, and must be built and overlooked by a professional team who has the knowledge and experience to connect all aspects of a project and complete the work as efficiently as possible. KCM staff is trained to be efficient with all that we do from office to site, and our vast network has Sub-Trades and professionals that are carefully selected and rated on their work in order to keep our services of high standards and competitive pricing. In a General Contracting construction method, the project owner works with an Architect to complete a design package to cover all aspects of the project. A General Contractor list is then selected to bid on the project. 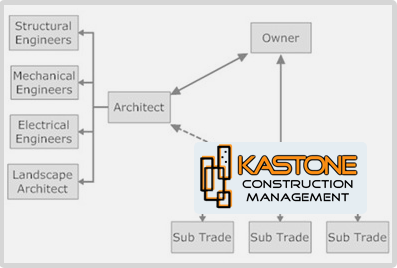 You can depend on us and our wide selection of the best sub-trades to complete your project smoothly and competitively. All of our work is transparent and you will not face any surprises with us as you will have a clear path right at the start of any project. Here is where we come in! We are your most competitive bidder and our Staff, Project Managers, Sub-Trades are very knowledgeable and will show excellent customer service practices by answering all your questions and delivering your needs and creative ideas for projects that are efficient and successful. Satisfaction guarantee! All our General Contracting work is governed by CCDC standards.